Holiday candy treats are popular with everyone. 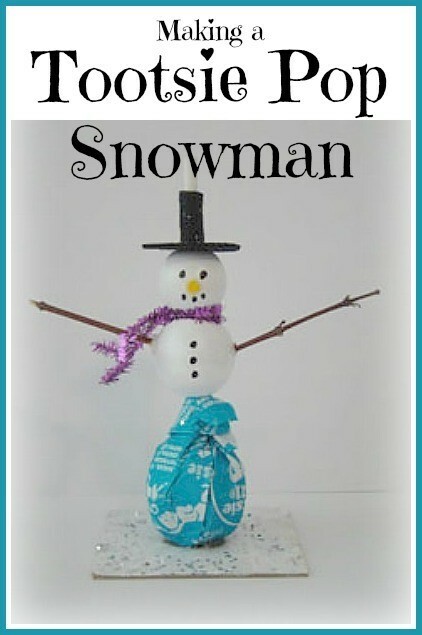 This tootsie pop snowman is an adorable craft Christmas decoration and a tasty treat. 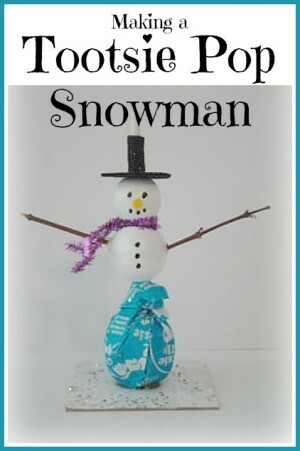 This is a guide about making a tootsie pop snowman. 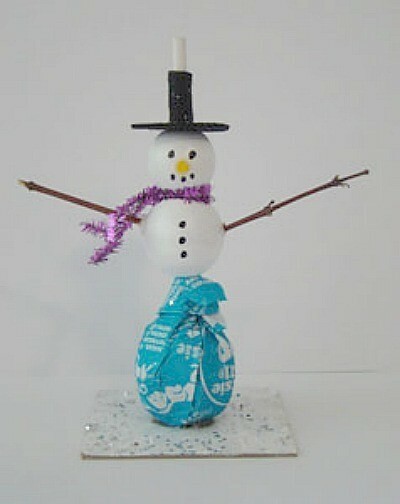 Easy to make Tootsie Pop snowman. After making the Tootsie Pop turkey this year, I kept trying to think of something similar to make at Christmas! This is one of the ideas I had. They would be cute as place cards at a meal or stuck on top of a present! Paint both wooden beads white. Let dry. Draw face and buttons on beads with Sharpie. Slide beads onto stick of Tootsie Pop. Hat Brim: Cut a circle (approx. 1.25") out of the "stiff" black felt. Using a hole punch, punch a hole in the center. Hat Top: Cut a rectangle (approx. .75"x1") out of the "stiff" black felt. Place "hat brim" on top of "head". Wrap rectangular piece of felt around stick and glue in place to make "hat top". Cut a small, long and narrow triangle out of the orange felt for the "carrot nose". Glue into place. Cut a piece of pipe cleaner for the "scarf". Wrap pipe cleaner around, in between the two beads. Cut two thin twigs for the "arms". Glue into place on the sides of the "body". Glue the Tootsie pop to the piece of cardboard. 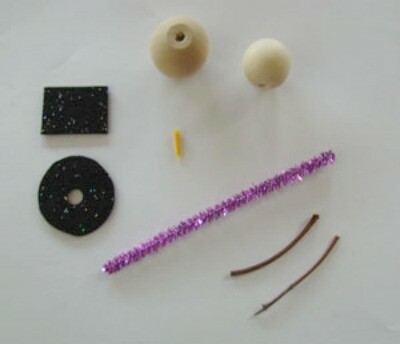 (Optional) Paint cardboard white and sprinkle glitter onto the wet paint! NOTE: Glueing only the "top of the hat" to the stick allows for easy removal of all piece prior to eating! 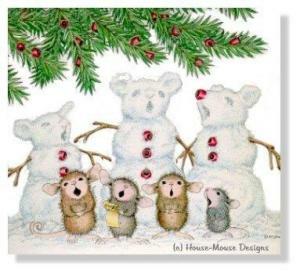 This would also be cute if you used marshmallows in place of the wooden beads. 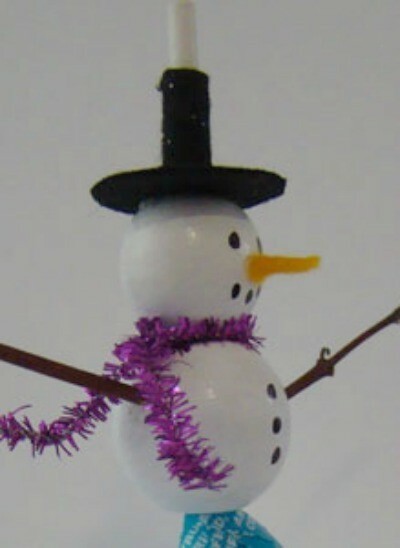 I'm also thinking fresh white gumdrops, paste food color for features and nose, fruit rollup for scarf and pretzel sticks for arms to make it all edible, stick it to a round cookie or cracker with icing and add more for snow.